Not sure if mentioned already, but i tried Sir elementalers Day/Night script today and i couldn't last in jj2 for longer than 2 minutes. fps dropped to 3 at a certain point with shortly an access violation after. Now i wanted to know what was going on, and apparently jj2 eats more and more memory over time. You start of with like 10mb memory usage for jj2. and in less than 2 minutes that turns into 600mb and it just keeps raising till it's too much to handle probably. I think this memory usage raising is a major bug and should be fixed as soon as possible. This has been already fixed in the upcoming patch and will be released in the coming days. This message has been deleted by Jerrythabest. Reason: Cooba was first. I made a blade gun, that the player can steer/control by moving. Level Packer v2 - With a GUI! Last edited by djazz; Feb 3, 2013 at 01:21 PM. That is remarkably similar to what I was thinking would be cool for the blade gun, minus the not working online very well. EDIT: Oh, wait, now I see the trigger scenery. Never mind. Last edited by Violet CLM; Feb 3, 2013 at 11:11 PM. This works very well in online-mode, as long as all the players have the same speed for all clients, as all clients do the same calculation. Well, I'd consider the lack of packet functions in AngelScript a major factor. The only reason it's not in there right now is because it's really difficult to pull off. But it must happen someday! Okay, that is understandable. A good alternative for now could be a "/s" command prefix that hides console messages for the following command, such as jjChat("/s trigger 2 on") for using triggers as global variables without spamming the console. I think it's just as good as the Bouncer, then. Looks awesome! Also kudos to Stijn for the snippet DB! Silencing the commands would be nice, but sadly due to the structure of the code it would require quite some work. Maybe we need to expose the features through the API directly, so you wouldn't need to rely on commands. While I do not know exactly how the code works internally, couldn't this be solved through a bool that the /s command would set for the duration of the executed command that would be checked by the console output function and suppress its output if true? Hmm, I first thought of having such a bool and passing it on with the commands, but indeed a more quick-and-dirty approach would be to have a global bool to silence the system messages altogether while executing the command. Let's see. It could be a temporary solution until someone is willing to help out with adapting all commands to take and respect a silence parameter. I really shouldn't have doubted you developers. I never thought I'd see so much progress in so little time. I saw butterflies following paths, timers for completing tasks, lizard ambushes, poisonous water flows, drivable platforms, timed out bonus stages, weather and daytime changing in a single level, a new boss, immortal skeletons, scrolling rooms ... I thought I'd have not seen any of these until year 2019. Instead, it's all here, already. I feel so ashamed for doubting you admin/developers and your good intentions towards JJ2. Besides, I can't understand a thing of this Angel Script thing. The only thing I managed to do is making the job seat in a Hotel level spawn food on the tables. Sorry for the scripting feature request spam (maybe you guys just so happen to need someone to implement all of this missing AS stuff), but are we going to see some multiplayer related getter functions anytime soon? Things like checking for started/stopped game, pregame and timelimit, as well as some form of /reset detection would be immensely helpful for creating custom game modes (which is what I am currently doing). when we add new coders to the project, they disappear. it's a worrisome pattern. anyway the answer to your question is yes, and soon. Ow... let's hope the project won't die out due to sudden mass-inactivity among the devs. Anyway, thank you very much for listening to the suggestions. As always, great job; I'm eagerly looking forward to the next release! Might be a question? How to insert mp3 or wav music for a level? Because i saw the mp3 and wav support JJ2+. Same as .s3m, .mod, .xm, etc. Just put the music file in the same folder as JJ2 and then type the filename in "Music file" in JCS or jjMusicLoad, depending on where you're doing this. Thanks for your help. Patch was very good anyway. Maybe it's better play with this amazingly good game on online. In addition, I would like to wish good luck to the patch development. Fixes the single player mode or just the multi player mode? As ever, click here to download. This is not intended to be an enormous, game-changing update like last week's. The main point of this release is to plug two memory leaks, one that was our fault (well, mostly mine) and one that existed from JJ2's beginning but became a lot more problematic when AngelScript started invoking it a lot. We also fixed several other bugs, added some new settings, and added a handful of global multiplayer-oriented properties to AngelScript, but the big news probably is the memory leak plugging. Or maybe not? You can find the full list of changes here. Last edited by Violet CLM; Feb 5, 2013 at 01:31 PM. [14:18:06] *** -t3>CJ is READY! [14:18:08] *** -t3>CJ is READY! DanZeal set the feature to default to true in plus.inis. However, the zeal servers themselves also have /idleserver on by default, whenever started/restarted. This mode seems to break the feature for the players because the game counts the non-spectated idleserver as a player participating, so until the server types /ready as well, the game won't start. However toggling idleserver off/on once in each zd seemed to fix the problem, because it made the server hide itself from the playerlist and it finally didn't count as a participant. Typing /ready as a server didn't work anymore. Anyway, it's not a very urgent fix as logical. Please. Do you can fix that bug when running JJ2+ in wine that usually when cycling level it crashes? From now on I will only download Angel Scripted levels! You can make hail from a little ball sprite and the Ice Bullet object, make the whole room turn red when you get hurt, set the maximum weapons to 10, set the Tuf Turt's health to 32 ... the possibilities are unlimited! Build 2013-02-05, the minorest of minor updates! Fixed bug in the /readystart command where the server would not consider itself idle if it began hosting in Idle Server mode. Fixed bug of the /cstop command's countdown being reinterpreted as a /cstart countdown if the game ends (e.g. by someone making a score) before the countdown runs out. Fixed bug where remote admins would be falsely announced as ready instead of receiving an error if the /ready command wasn't typed correctly. All changes are server-side, so if you literally never host, you don't strictly need this update (though you might as well). Now, for serious, no more bugs please. Every Wine crash I've discovered goes away if you remove bass.dll (delete/rename/move it, whatever) and disable the chatlogger. This is the solution I am using, works perfectly for me. It seems to be some combination of TSF/Plus/Bass code that Wine just doesn't like very much. I've got this identified: this is true, but only in TSF. Last edited by cooba; Feb 6, 2013 at 04:36 AM. 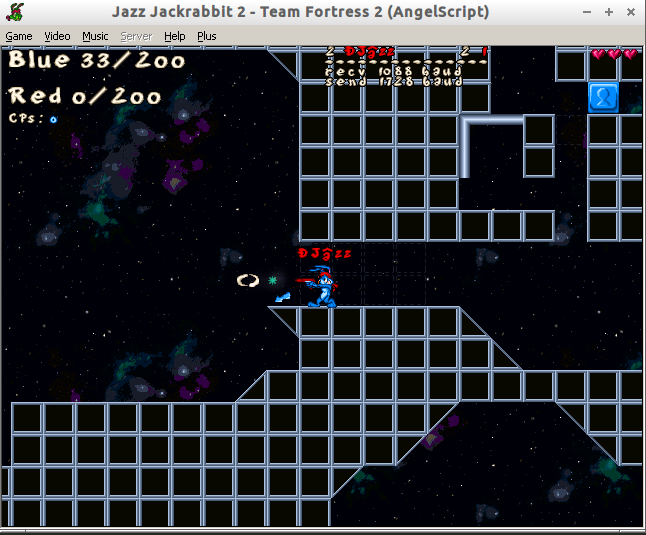 I'm eager to upload some levels made with JJ2+ and AngelScript, but I'm still blocked because of my spam uploads. I sent a message to 3 of the admins, but I got no response yet. Which is the procedure to follow if I want to be able to upload levels again? Huh. How the heck did we break that? Funny how things that work precisely the same in 1.23 and 1.24 from the outside, turn out to work differently inside. Sigh. Huh. How the heck did we break that? startup.cpp, line 6984 would be my guess. Yes, fixed. Change the 0x24 to 0x20. This is absolutely amazing. I'm definitely going to look into making some cool AngelScript codes. Assuming you're using Plusifier rather than manually injecting the DLL every time (eech!) you can just name the result Jazz2.exe. JCS will use it then, as will things like CaptainCook. Renaming the original Jazz2.exe to, say, Jazz2notplus.exe, won't break anything. Random idea: onTrigger function. As in, call it when the trigger is turned on (but not for remaining on). Maybe split into onTriggerOn (call when turned on), onTriggerOff (call when turned off), onTriggerSwitch (any change). You can imitate this with existing capabilities of course but it's a bit cumbersome and I'm worried about checking too many conditionals every frame (what if we go up to 256 trigger IDs some day? ), though I suppose that probably isn't a concern nowadays. There is a major regression in the latest update. 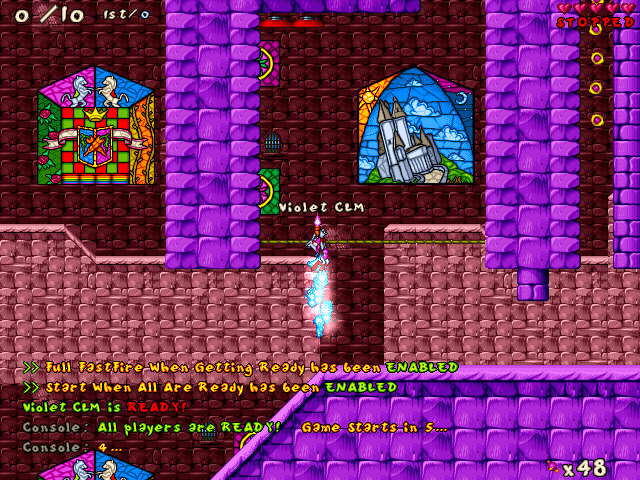 Applying a palette in a level with many animated tiles can cause a crash. This does not occur with the Jan 28 version. The behavior seems to be random, but it usually happened within 70 calls in the level I was using. ___test.j2l almost always crashes, ___test2.j2l never crashed (it has most animated tiles removed). Removing the destruct scenery events from the animated tiles did not change anything, but removing the tiles did. Editing jjPalette directly is not the culprit either (tried a new one, didn't help). Maybe a bug tracker of some sort would be a good idea? Weirdest. Bug. Ever. It doesn't really crash, it just hangs at the palette.apply() call. if with "hangs" you mean that it breaks, the call is "jjPalette.apply()" as far as I remember. I did mean to say "jjPalette.apply()". But it doesn't matter much, either way it hangs on the apply() method in the jjPAL class. I've found the line of code that causes this. Let's see what we can do about it. I'm pretty sure that JJ2 doesn't contain onTrigger() itself, so to add it, JJ2+ would just have to check for those "too many conditionals every frame" on its own and it wouldn't be any faster. However, it's worth noting that there's no reason this would be slow at all, as all you have to do is check current trigger state (JJ2 array) and previous trigger state (custom array you should update manually) for every trigger. So, check state of two booleans in a for() loop that repeats 32 (or, in your "some day" scenario, 256) times. By my estimation, this won't slow the game down by more than 1.0*10-20 fps. In other words: it's not cumbersome, it gives your script approximately up to 6 more lines, and you shouldn't worry about speed issues, there's no way this would slow the game down. I am an official JJ2+ programmer and this has been an official JJ2+ statement. Last edited by Sir Ementaler; Feb 7, 2013 at 02:01 AM. Wakeman curiously clicked a checkbox back in '98..
Only to see the results almost 15 years later! JJ2+, play old levels the way they're meant to be played..
Add SlazRabbit on Xbox Live if you want to play some GoW1/2/3/J or Destiny1/2.